In the 1970s, Clement Dodd’s legendary Studio One Records went through an amazing period of re-birth working with new artists such as Willie Williams, Lone Ranger, Michigan and Smiley, Horace Andy as well as continuing to work with classic artists such as Alton Ellis, Freddie McGregor, etc. Re-versioning classic Studio One rhythms became the order of the day in the 1970s, not just with Studio One boss Clement ‘Coxsone’ Dodd, but with every Jamaican producer of note employing their own in-house musicians to copy the music emanating from Brentford Road. 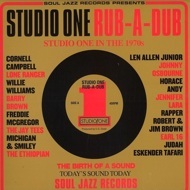 The music on Studio One Rub-A-Dub features classic and rare tracks from this amazing period, from the likes of Cornel Campbell, The Heptones, Johnny Osbourne and many other legendary artists. Sleeve-notes are by Chris Salewicz, the acclaimed writer who has written books on Joe Strummer, Bob Marley, The Rolling Stones and many more.